I flew into Denver last night, and caught the last snow storm of the year (according to the locals’ guess). I’m loving it, even though it made the drive to Boulder an adventure. I met some friends for dinner at The Kitchen, somewhere I’d wanted to visit after hearing about its slow food philosophy. It must be tough to get local produce at this time of year, but the potato fennel soup and herb gnocci I had was great winter fuel. Even better were the garlic fries, which seemed like they might show the British influence, since they were the closest approximation to chips I’ve found over here. Thick, with a crispy surface, but a soft and fluffy interior like mashed potatoes, they really hit the spot. 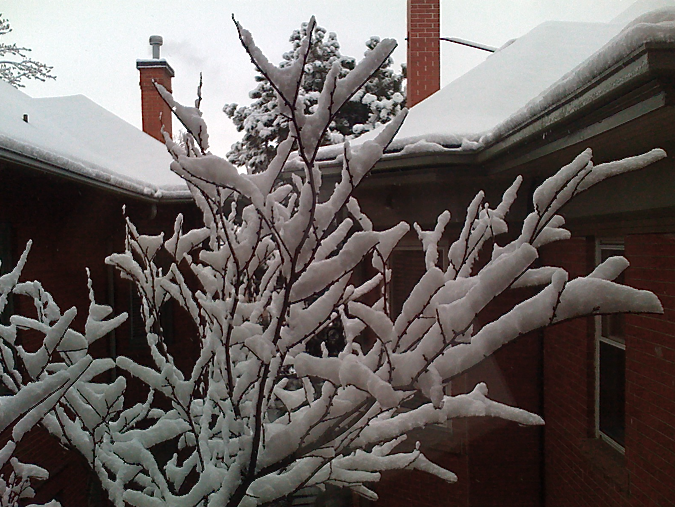 This morning was beautiful, with snow making the trees look more like coral. Josh and Rob from Eventvue joined me for breakfast at Burnt Toast. Colorado has the best breakfast places, me and Liz still speak in awed tones of the meal had last year at Dozens. Burnt Toast didn’t disappoint, with a light and fluffy breakfast burrito and very friendly service. I got to hear all about Josh and Rob’s startup adventures. Their determination to fight past all the inevitable problems was truly impressive, and now they’ve got a completed first release to show for it. Don’t count on it being the last – I’m sure the snow gods have at least one or two more good ones in them. Great to brainstorm with you over a delicious breakfast. Come back again and we’ll continue your tour of amazing breakfast places in Boulder. PS – you really should check out Intense Debate for your blog comments.